This post is sponsored by Schick Hydro® Systems and Social Stars. As always, all opinions and recipe are my own. 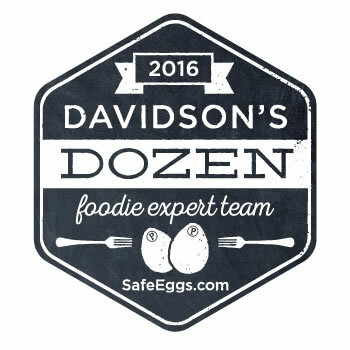 Thanks for supporting the brands who support Shared Appetite! 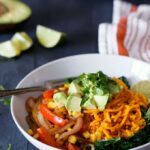 This Southwest Sweet Potato Noodle Bowl with Kale and Avocado is healthy, gluten-free, vegetarian, and paleo-friendly! And that, my friends, is how this Southwest Sweet Potato Noodle Bowl was born. I know, it’s a memorable story. You’re welcome. oooo, I still haven’t used that kale yet. Check. Hello red pepper in the freezer. You’ll be delicious. And corn! I love me some corn. Red onions and lime, I always have you on hand on the counter. Thank you very much for your reliability. Wow, there’s actually an avocado here in the fridge. Asheley must of missed it. That’s a rare opportunity that I must take advantage of. And that’s what I love about cooking. You can totally whip up an epic meal just with what you have lying around… assuming you have fridge stocked with more than beer, ketchup packets, and that I wonder how long that has been in here sandwich. Yea, you know who you are. All my dudes out there. And all my ladies that want their dudes to have super smooth skin. Check out the Schick Hydro® all new Tumblr page and give them a follow. They are all about Your Face, Your Story… Make It Epic. They want to get you ready for your everyday epic experiences with a super smooth shave. 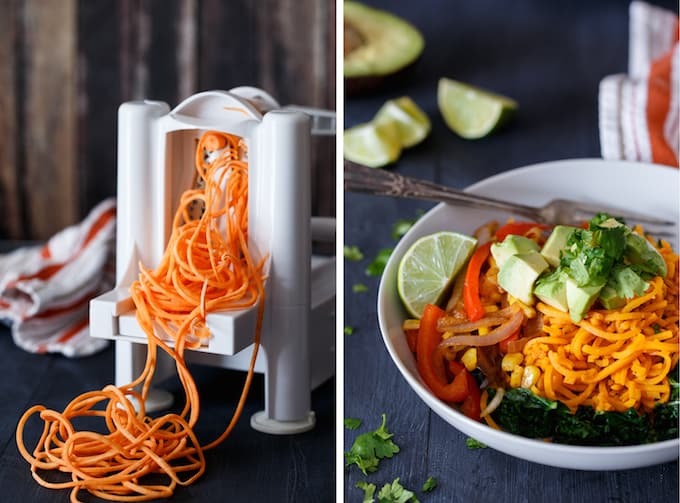 Using a spiralizer fitted with Blade C, spiralize sweet potato into noodles. Heat 1 tablespoon of olive oil in a medium skillet over medium heat. Add sweet potato noodles, season generously with Kosher salt and pepper, and cover with lid. Cook, shaking pan occasionally and removing lid to stir once in a while, until noodles are “al dente”. They will have a slight crunch to them. If the noodles start to stick, add two tablespoons of water (repeat as necessary) and continue to cook until noodles reach desired doneness. Meanwhile, heat 1 tablespoon of olive oil in a medium pot over medium heat. Add kale and season generously with Kosher salt and pepper. Cook, stirring occasionally, until kale leaves are a little wilted for a chewier texture, or if you prefer it more tender, cook for longer. Finally, in another medium skillet, heat remaining 1 tablespoon olive oil over medium heat. Add onion and pepper, season generously with Kosher salt and pepper and a pinch of cumin and chili powder, and cook 5-7 minutes, until vegetables soften but still have a little crunch. Add frozen corn and cook for 1 minute, until warmed through. 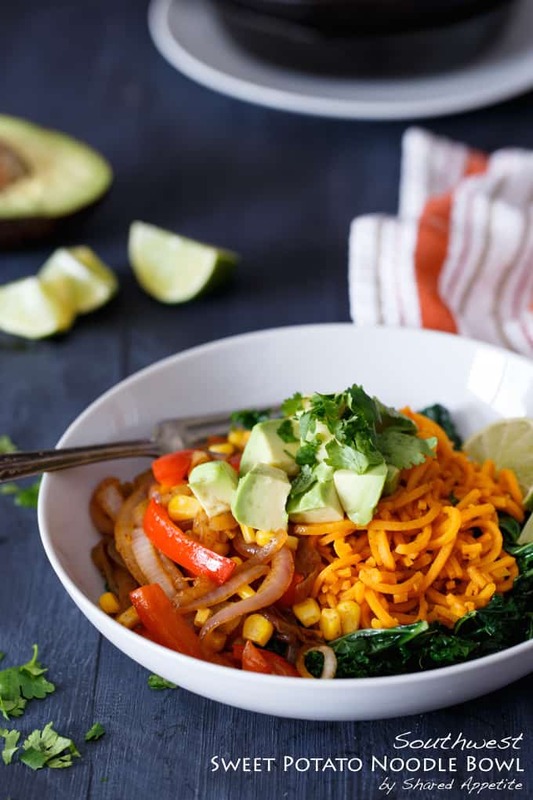 Divide sweet potato noodles, kale, and vegetable medley among bowls. Top with chopped avocado, a lime wedge, and chopped cilantro if desired. Devour immediately. wait just one minute! You spiralized (no, I can’t spell that) sweet potatoes!?!?! I am crying a silent tear that I just found your blog. How many other genius ideas have I missed?! Love this recipe, Chris! Pinned! I have the same spiralizer. It’s the best, isn’t it? Love that you spiralized the sweet potatoes. Beautiful dish Chris. It totally is! I need to start spiralizing more stuff! Sweet potato noodles … I love that idea! And I love even more that you rummaged around in your fridge and came up with something as gorgeous as this. Thanks Helen! Sometimes it’s fun to rummage around and figure out what you can create, isn’t it?! This looks fantastic! I definitely do that with kitchen gadgets – if someone asked me specifically if I had [certain kitchen gadget], I’d probably remember it, but otherwise, out of sight out of mind. 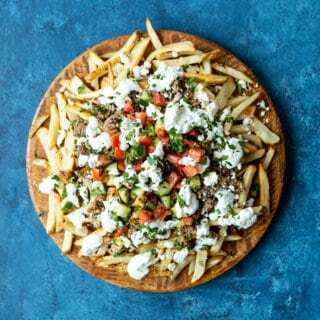 I love that this southwestern dish doesn’t rely on cheese for flavor – you’re looking out for us lactose intolerant people! You know it CakePants! 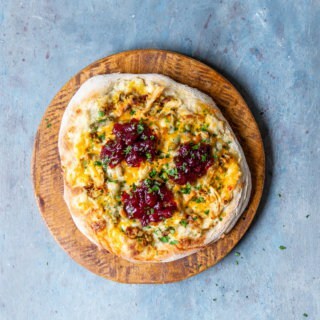 No need for cheese here! I always forget about my spiralizer too! I go through phases, I’ll crank out a million recipes with it, then it won’t see the light of day for months. This makes me want to break it out again, love everything about this dish! Hahaha we are one in the same! You seriously just reminded me about MY spiralizer and how it’s been way too long since I last used it (2-ish weeks—whaaa!!?) Anyway. These noodle bowls?! Uh, gimme all dat awesomeness! I STILL have yet to try sweet potato noodles and I think you just convinced me. Love everything you’ve got goin’ on here! You know I still don’t have a spiralizer and I really need sweet potato noodles in my life. I think I’m just gonna have to kick the Yonanas machine to the curb to make some space, and pick up a spiralizer already. Hahaha you of all people definitely need a spiralizer!!! You would be whipping up all sorts of amazing eats with that thing! Get on in Sandra! I think I need to get myself an inspiralizer. Those sweet potato noodles look delicious! I love it when I end up with a delicious meal without really planning it/just by using fridge leftovers. This looks awesome! I can’t relate with the kitchen gadgets though – my apartment is so tiny that I know every little thing in each nook and cranny! You crack me up, love your writing here and I was wondering how the sponsor was going to be worked into all of this! This sounds so good and the sweet potato definitely holds up better than a zucchini, nice! Your thought process reminds me of myself and the show Chopped. What’s available and what can I do and one idea leads to another. #WolfpackEats! Thanks dude! Love the show Chopped! It would be so much fun (and super stressful I’m sure!) to be on that show! That is delicious looks like very nice one pot meal.Love your creative ideas.